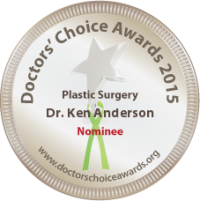 Dr. Ken Anderson, an expert in the Hair Restoration Surgery field, has been nominated for the 2015 Doctor’s Choice Award for Plastic Surgery. This award is very prestigious and is based on actual reviews by patients, as well as recommendations by other physicians. The Doctor’s Choice Awards is a review site designed to help doctors fight back again unfounded criticism, and to have a positive influence on the overall perceptions of consumers. Doctors are able to review and rate other doctors on DoctorsChoiceAwards.org. Physicians who are colleagues, friends, teachers and referring doctors are able to simply review other physicians, enhancing online reputations. Each year, a winner is selected from every city represented based on the quantity and quality of doctor reviews received within a year. To learn more about Dr. Ken Anderson, Robotic Hair Restoration or Hair Restoration Surgery visit www.atlantahairsurgeon.com.